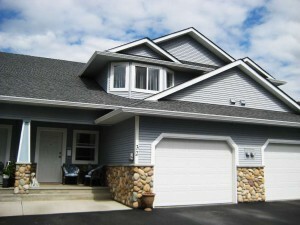 Immaculate 3 bedroom, 2.5 bathroom two storey original owner townhome in Batchelor Heights. The main floor features a spacious great room featuring a large kitchen with lots of cupboard space & a gas fireplace. There is a two piece bathroom & laundry room is on the main floor as well. The 2nd level features 3 large bedrooms, one 4 piece bathroom & a 3 piece ensuite. The basement has rough ins for a full bathroom, there is a large finished rec room which would make for a great media room & tons of storage. All appliances are included, there is central A/C & roughed in central vac. There is a patio off of the living room leading to an open grassy area. The strata will allow for a temporary fence to allow for pets in this area. This unit is very well situated & has a lot of privacy. There is a one car garage & two additional parking spots. Pets & rentals are allowed with restrictions. Non-smoking, non pet home.